They call me Crazy Phil, with my Crazy 7s, but I know the truth. Click here to play! 7 has always been my lucky number. Ever since I was a little kid playing boardgames I'd always win when I rolled a 7. I can't count the number of times I won a poker hand with a pair or trip 7s. Had my first schoolkid crush at the age of 7. When I turned 25, though (2 plus 5 is 7) I was down on my luck and realized I hadn't had a lucky turn with 7 for years. It dawned on me. 7s were being seen less and less. The government had clearly cracked down on the number 7, not wanting its good fortune to free the populace from the government's tyranny! Just kidding! 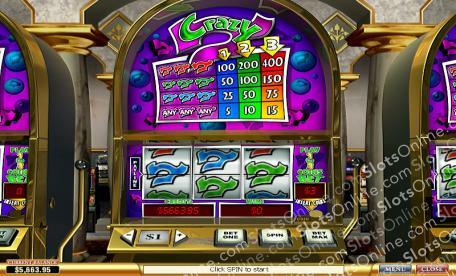 Crazy 7 is a unique slots game that only believes in one number � the lucky number 7. Matching any three sevens on the single payline wins, while matching three 7s of the same color means even bigger prize money. If 7 is your lucky number, then today could be your lucky day with Crazy 7s.